Successfully Added HK Warehouse Fingertip Gyroscope Package - 5 Colors, ABS Material, Reduce Stress And Anxiety, Highly Portable, Random Colors to your Shopping Cart. Reduce stress, anxiety, and make all your negative thoughts disappear instantly with these fingertip gyroscopes. Coming in a package of 5 pieces, you’ll be treated with randomly selected different color gyroscopes which may be blue, green, yellow, orange, or black. Hand Spinners are widely known for reducing stress levels and are often used by psychiatrists to solve issues related to OCD, ADHD, and PTSD. Thanks to this, these cool electronic gadgets are the perfect treats for people that work in a stressful environment or that are experiencing any other type of anxiety. Additionally, they are a fun little gadget to play around with for anybody that finds it complicated to concentrate. Crafted out of tough ABS material, these fingertip gyroscopes are extremely durable and can withstand the occasional drop. The fact that you’ll get 5 pieces allows you to share these amazing gyroscopes among friends or family. Not only will it allow them to reduce stress levels, it also gives them a fun little toy to play around with and to learn tricks with at times of boredom. Featuring high-speed bearings, these hand spinners spin up to 2 minutes with a simple touch of your finger – providing you with a calming and relaxed feeling while holding it in your hand. This effect of the hand spinner is sure to make you feel better and relaxed while leaving you with a great impression. Thanks to its compact design, these fingertip gyroscopes can be easily carried around anywhere you go. With this amazing stress-aid at your side, you’ll always be able to calm down and carry on with your daily tasks without the need of feeling anxious. 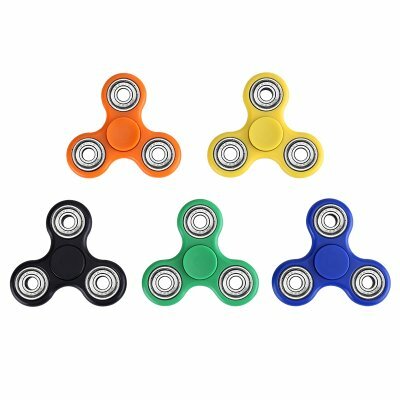 Whether you use it for its stress release purposes or simply for fun – this hand spinner certainly is a cool gadget that is sure to meet the likings if anybody out there. This fingertip gyroscope comes with a 12 months warranty, brought to you by the leader in electronic devices as well as wholesale electronic gadgets.. Very good quality, spin for about 2 mins. very happy with the purchase highly recommended.